We are still receiving amazing news every hour with regards to the bikers’ protest at the French Government proposals to make filtering through the traffic illegal in France. We have just learned that Paris was not (see our previous post, click here) the only city in France where bikers had decided to take possession of the local public transport, following the French Transport Secretary, Jean-Marc Belotti, who said that “If they [bikers] are not happy, they can take the metro like everyone else”. Bikers descend en masse to the Paris metro, following the Government's advice to take public transport if they're not happy! Well, while most major cities in France have a metro or underground network to get around town, smaller cities don’t. 1,500 bikers demonstrated on Saturday in the eastern town of Nancy, where not only did they block the roads in the town centre, but also jumped on buses en masse, with their helmets on, and preventing everyone else from getting on to the local public transport. They occupied all the seats straight away, so no one could possibly sit down, and they also made sure that every little space was occupied by a motorcyclist. 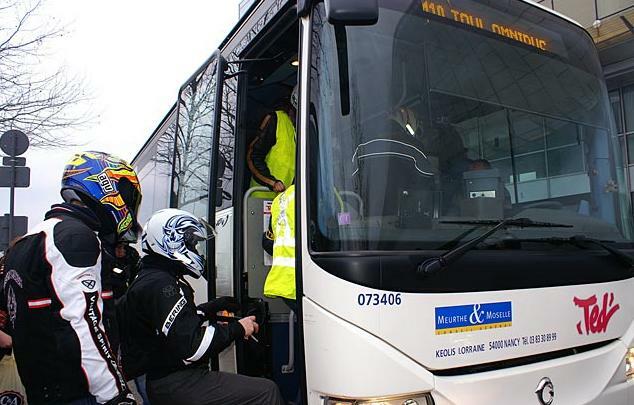 The authorities want bikers to use public transport if they’re not happy, what a great suggestion! Not only can they use it but they can also block it and bring it to a complete standstill if they want to. Oh dear, what a bad suggestion the Government has made, haven’t they? We have heard that bikers will do this again once a week if the Government doesn’t scrap their proposals immediately. Power to the people! 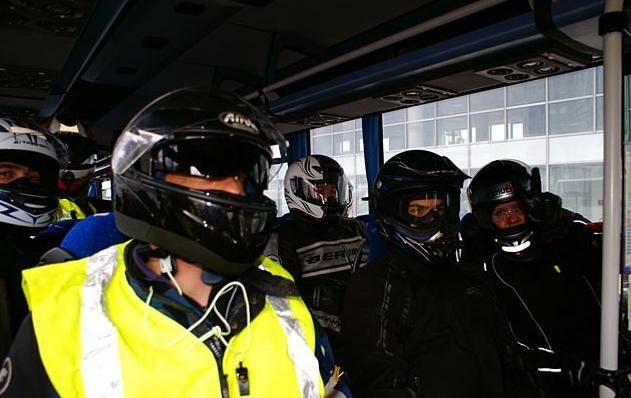 Bikers take over a bus in Nancy, as advised by the Government, if they're not happy! Bikers occupy every seat on the bus to make sure no one else can sit down! Who said they had to take public transport if they're not happy? 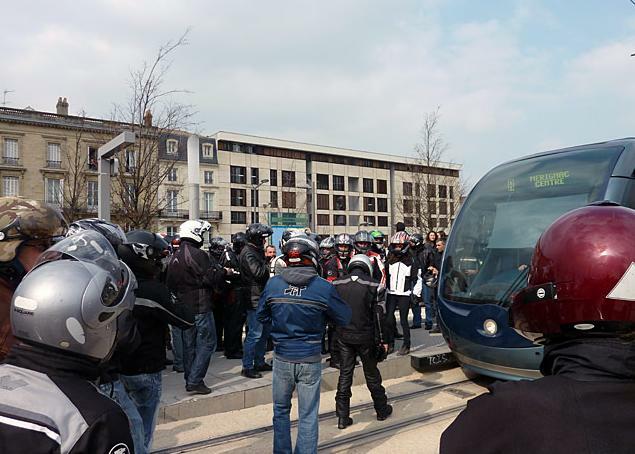 In Bordeaux, hundreds of bikers also took possession of the overground train system. They all jumped on the train, called “tram”, thus blocking everyone else from getting on board and blocking the train at the same time, causing gridlock on the whole network. Bikers try to jum on a local train in Bordeaux, causing gridlock on the whole network! Rule number one for everybody – never piss off and mess up with a biker, especially if they happen to be French! Keep an eye on the bikers, Transport for London (TfL)! In London, France & Europe (3rd EU Directive 2011-2013) we PTW’s are facing ever more regulation but these don’t appear to address a genuine need to solve a problem. It is more a case of a politician trying to strengthen power by dealing with a difficulty “hyped” up by themselves. One might be forgiven for believing their intelligent foolishness but this shows that they don’t have enough real work to occupy their time. This foolishness disguised as wisdom then relies on lies, exaggeration, double-speak, political jargon & frequent reference to a future nirvana to support the cause. Even when demonstrably proven wrong/misguided/immoral/costly the government minister or councillor invariably continues with it. Westminster CC’s officers are an example of this. Taking to the streets, motorways & métro will be the only way that we’ll be recognised & our dissatisfaction addressed. Je suis pressé donc je n’ai pas assez de temps de faire une traduction. Il me semble que la manif de samedi passé était bien faite. Bon courage. great stuff, nice to see the French bikers standing up to the scum in power, what a stupid idea to make filtering illegal, you might as well tell them they are going to ban motorcycles on the road as they will have to sit in traffic just like the cars, what a bunch of idiots! The only issue with filtering through traffic is in the unfortunate event of an accident. There are many cases out there where bikers have been knocked off and are held 100% responsible for the accident. see for examples link below. In my opinion i can imagine the story behind making filtering illegal it when it come to motorcycle accidents, if your found filtering you will be immediately to blame. I can also imagine the insurance company saying if your filtering it will void your insurance!